Wenn du an unserer Arbeit interessiert bist oder uns unterstützen willst, melde dich doch einfach! Spendenquittung für Einmalspenden bis 200 € zum selbst ausdrucken hier. Für das Ausstellen von Spendenquittungen benötigen wir Deine/Ihre Anschrift. IWS: Hennigsdorf – they tried to deport her again! On the 7th of September, around 4 o’clock in the morning, in a Heim in Hennigsdorf, a refugee woman was again compelled out of her room, violently pushed in to a police car and taken to the airport in one more forced deportation attempt. They didn’t succeed because the pilot refused to take in a woman in such a distress. They came as they do: in many, violently pushing, humiliating, handcuffing as if the woman was a dangerous criminal. We, from the IWS, went to Hennigsdorf, to see her, after once again she resisted her deportation and what followed was a horror display of more violence against her and also against us, her friends. We arrived in the Heim around 12h. She was nervous, weak, scared. Her arms were red and swollen. Her nightgown, clothes she was wearing when she was arrested, was full of blood, her back had red marks left by the police. Continue reading IWS: Hennigsdorf – they tried to deport her again! 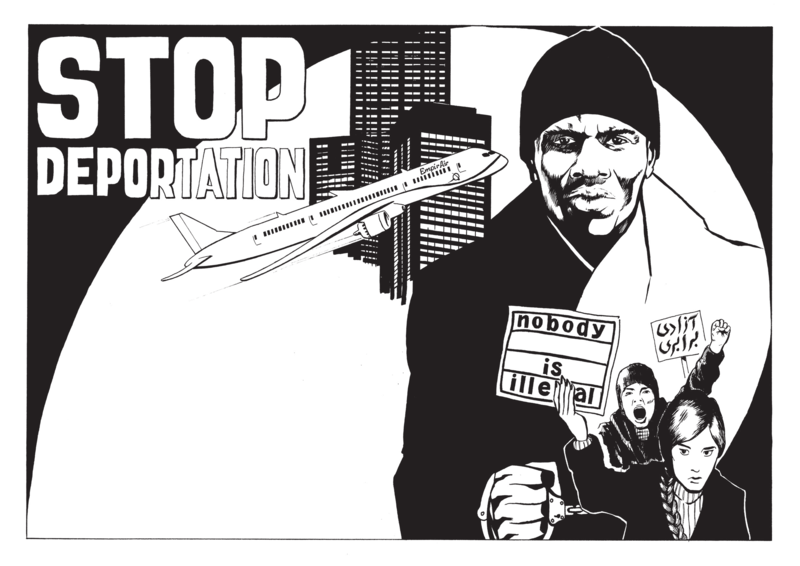 Auf Oplatz.net gibt es den neuen Stop-Deportation-Comic zum herunterladen. Auf Arabisch, Englisch, Farsi, Französisch, Deutsch, Romanes, Serbo-Kroatisch, Spanisch, Türkisch. Bei Asyl.net gibt es Übersetzungen der Informationen zur Anhörung im Asylverfahren. Auf Albanisch, Amharisch, Arabisch, Bosnisch, Deutsch, Englisch und Russisch. Unsere Freundinnen vom International Women’s Space haben eine (nicht-)Abschiebung dokumentiert. Vielen Dank an unsere Schwester für den Mut, ihre Geschichte aufzuschreiben. Geschichten wie diese sind die traurige alltägliche Realität von vielen geflüchteten Frauen in Deutschland. Wenn wir wieder und wieder solche Sachen hören ist es für uns umso mehr eine Motivation, laut zu bleiben, weiter zu kämpfen! “Last Thursday, the 30th of July, as I went to the Foreign Office/Ausländerbehörde to renew my Identity Card/Ausweis, they told me there was a bomb threat in the building and that they couldn’t work on my papers, that I should come back the next day, on Friday, at 8 o’clock in the morning, but on Friday, at around 3 o’clock in the morning, they came to deport me. I was praying in my room in the Heim when I heard a very strong knock on my door. I opened it and saw two police women standing there. Together with them was the boy from the Ausländerbehörde, the same boy who had told me to go back on Friday to renew my Ausweis. This boy is a wicked boy. Women in Exile e.V. is looking for sustainig members! Through many small but regular donations we can ensure the continuity of our work! There is a lot to do! A monthly money tranfser order is the best way to support us. Please inform us by seding a short email to info@women-in-exile.net, including your address for donation receips. We are also happy to send you the print version of our newsletter! PM 07.04.2019 World Health Day: Refugees have a third class health coverage, where is universal health coverage for everyone, everywhere?